I’m going to let you in on a weird little fact about me…I prefer ketchup over chocolate. Chocolate has never been a major craving of mine. I know…so weird. This probably isn’t the best lead in sentence to convince you to make these brownies….I promise they do not taste like ketchup. Total let down, I know. womp womp. Actually, chocolate…well, milk chocolate is too sweet for me. However, recently I have become a huge fan of gooooood dark chocolate. 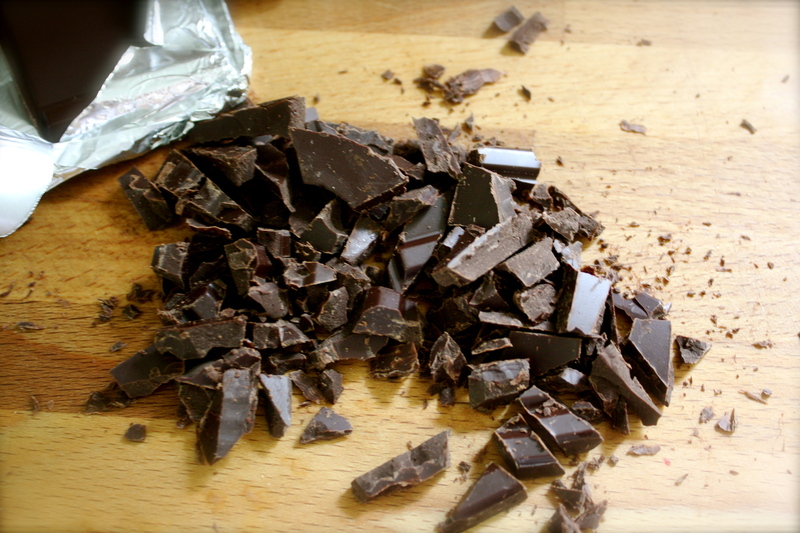 That is, dark chocolate with at least 72% cacao…preferably with 85% cacao. And bonus….it’s good for you. And sometimes you just need some good melty chocolate. So I decided to find a way to turn this awesome dark chocolate into a flourless brownie so that my gluten free hubby could also partake. I’m a doll, I know. Also, if he helps eat them, then I don’t fall asleep with the whole pan in bed. Don’t judge! Although I have dabbled in flourless and gluten free brownies before, these Paleo Fudge Brownies take the cake…pun intended. They taste amazing and are gluten free, grain free, dairy free, vegan, peanut free, soy free, and processed sugar free. Which also makes them a great dessert to take to cookouts if you have anyone that may have food allergies or sensitivities. I like these better than conventional brownies that are loaded with flour and sugar and butter (blasphemy, I know), which typically leave me in a coma. And even my sweet-toothed, chocolate-loving hubby adores these. 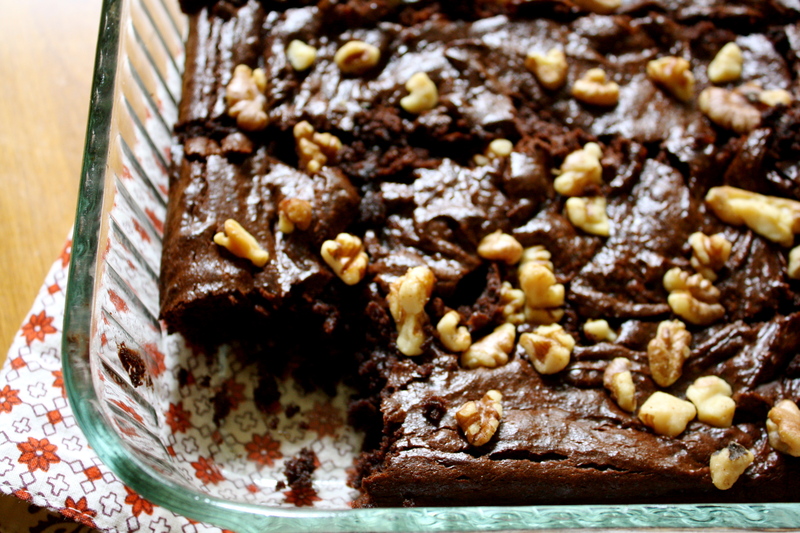 Instead of flour, the base for this fudge-tastic brownie is almond butter! You could use any nut butter that you have on hand. Just make sure that it is unsweetened and all natural. They are sprinkled inside with melted chunks of good dark chocolate (SWOON) and topped with toasted walnuts. Are you drooling yet? When baking these puppies, make sure you do NOT overcook them. If overcooked, they will taste like brownie croutons, which are still edible, but not as delightful as fuuuuuuudgy brownies. If you slightly undercook them, I guarantee you will take them to bed with you. No judging here. Added bonus, my friends…they are good for you, and are packed with protein, dark chocolate, and omega-3s from the flax meal and walnuts. Preheat oven to 350°F. Spray an 8X8 inch baking dish with nonstick spray or grease well with butter or coconut oil. Pull out your food processor. If you don’t have one, use a stand mixer and substitute another banana (two total) for the dates. The dates will not break down in a stand mixer, only a good food processor. Combine the banana(s), dates (if using a food processor), almond butter, and ground flax seed mixture. Pulse in coconut oil, apple sauce, agave nectar, and vanilla until the mixture is smooth. 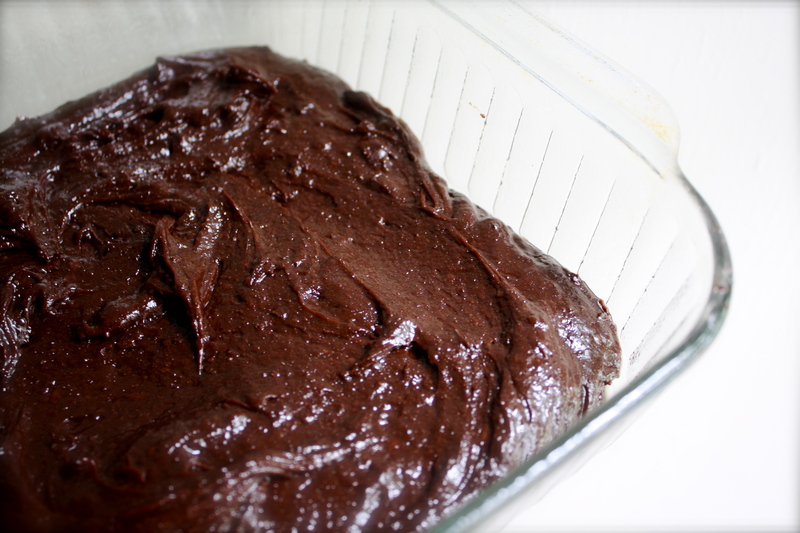 Add cocoa powder, salt, and baking soda. Pulse to combine. Transfer batter into a well greased 8×8 inch pyrex baking dish. Top with chopped walnuts. Ha! I hear ya. Great nightly tradition! Trader Joe’s has helped my budget in the dark chocolate arena…and the wine arena too. Give me a bottle of three buck chuck Shiraz and a bar of smooth dark chocolate and I’ll die happy!
. It tastes amazing. I used a banana that wasn’t to ripe so I had to add more honye to sweeten it a bit. But omg I feel like I did when I could eat everything. I’ll be making this for Christmas again. These brownies always hit the spot for me. I bring them to dinner parties with non gf eaters and there is never a brownie left! Glad you loved them.